The popular YouTube channel's creator was fired for allegedly harassing women. Its next chapter is unclear. It’s been almost two weeks since Andy Signore — creator of the YouTube channel and online movie magazine ScreenJunkies, and senior vice president of content for its parent company, Defy Media — was suspended after several women came forward with allegations of sexual harassment and assault. The next day, Defy terminated Signore — the same day as Harvey Weinstein, and about a week before Amazon Studios’ head Roy Price resigned for inappropriate behavior. Yet while The Weinstein Company and Amazon Studios work to convince the public that they’re back to business as usual, Defy does little to hide it’s in crisis mode. 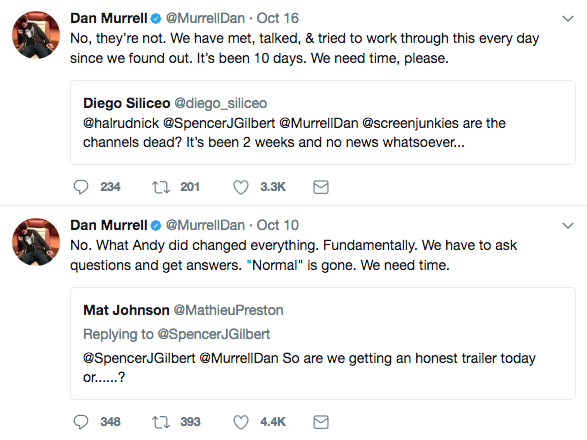 On October 8, the day Signore was fired, ScreenJunkies and Defy (which oversees eight brands, including Smosh, Smosh Games, and Clevver) tweeted the official statement announcing Signore’s firing. 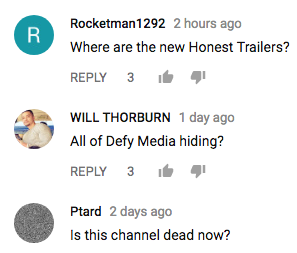 Since then, those Twitter accounts have been silent and the official Defy Media statement wasn’t prominently displayed on ScreenJunkies’ YouTube channel, which has 6.2 million subscribers, versus 145K Twitter followers (that statement was the pinned YouTube comment underneath the last video Signore hosted). Signore hosted ScreenJunkies’ “Movie Fights” and co-created both “The ScreenJunkies Show!” and the twice Emmy-nominated “Honest Trailers,” which provided weekly, deadpan, four-to-eight-minute film recaps. However, ScreenJunkies hasn’t uploaded any new content since Signore’s exit. “The silence from SJ is disconcerting,” wrote commenter Kevin Johnson. Others chimed in. Joe Starr, an Honest Trailers writer, expressed gratitude to those who helped ScreenJunkies exceed 1.8 billion pageviews to date. Hey guys. I just wanted to say that we’re working on it. Thanks for being an amazing community of fans. Brief update to echo what Dan/Joe said for those wondering. We’re meeting daily to find a good path forward. Thank you for being wonderful. IndieWire made multiple attempts to contact Defy representatives, but emails went unanswered and phone calls rang without response (and the main number’s voicemail was full). Via its website, Defy’s headquarters in midtown Manhattan encourages, “If you’re in town, drop a line and swing by,” so IndieWire did just that. The lobby suggested business as usual: four flat-screen televisions played ScreenJunkies programming on a loop, and a receptionist sat behind a desk decorated with a banner of Halloween ghosts. IndieWire requested Jodi Smith-Bulhack, Defy’s senior VP communications, and the receptionist said she’d be out shortly. Instead, a lawyer came to the lobby: Adam Silverman, Defy’s assistant general counsel and senior VP of business and legal affairs. He said she was “unavailable,” but we should continue emailing her to set up an appointment. That evening, Smith-Bulhack wrote in an email, “Screen Junkies programming will resume shortly. I will keep you updated.” When pressed for additional details, she redirected us to their Oct. 8 statement.